AUCKLAND, New Zealand. – August 16, 2016 – Bungie and Activision Publishing, Inc., a wholly owned subsidiary of Activision Blizzard, Inc. (Nasdaq: ATVI), announced today one of the largest content offerings in gaming to launch this year – Destiny – The Collection. Containing every release from the award-winning action shooter franchise to date, including the new large expansion,Destiny: Rise of Iron, Destiny – The Collection is the perfect opportunity for new Guardians to join the fight for humanity’s survival. For legacy gen players, Destiny – The Collection marks the opportunity to transition to playing Destiny on a current gen system through the upgrade program which begins today and runs until January 31, 2017. Destiny – The Collection will launch alongsideRise of Iron on September 20, 2016 and will be available for the PlayStation®4 and Xbox One (PlayStation®Plus, Xbox Live Gold, required for some features). Gamers who pre-purchase Destiny –The Collection digitally will be able to experience Destiny, The Dark Below, House of Wolves and The Taken King immediately, while awaiting the release of Rise of Iron. “Destiny – The Collection is the perfect starting point for gamers who have yet to experience Destiny,” said Byron Beede, Sr. Vice President of Destiny at Activision. “Destiny – The Collection contains some of the most engaging content Bungie has ever created and the soon-to-be released Rise of Iron. It also includes a character boost that will allow new players to instantly join in with friends who are already enjoying Destiny.” Players who pre-order Destiny – The Collection or Rise of Iron will receive the black and silver Iron Gjallarhorn*, a fan favourite weapon making its return to power. Those that pre-order digitally or at select retailers will also receive the Iron Gjallarwing Sparrow*. Destiny brings you into a bold world of action and adventure where you are a Guardian of the last safe city on Earth wielding incredible powers. Explore the ancient ruins of our solar system as you immerse yourself in a cinematic single-player campaign. Join up with friends in three or six player co-op activities. Spar with your fellow players in a variety of competitive multiplayer modes. Upgrade your character to create a powerful hero as unique as yourself. Become Legend. 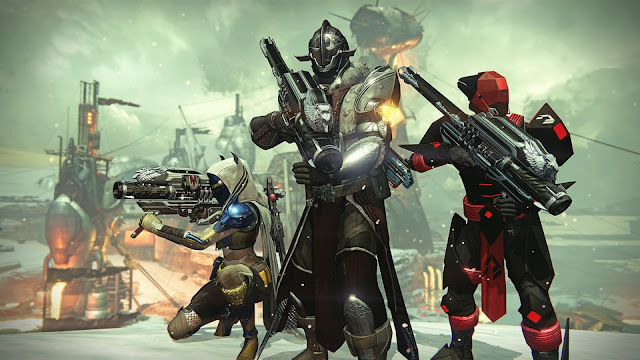 Destiny – The Collection is rated M for fantasy violence and online interactivity. Destiny – The Collection will be available at a suggested retail price of AUD$89.95. At launch, PlayStation gamers will also get access exclusive content for Rise of Iron, timed exclusive until at least Fall 2017.